At the Location step of the wizard, select an ESX(i) host to which the clone/virtual copy of the storage snapshot must be mounted. 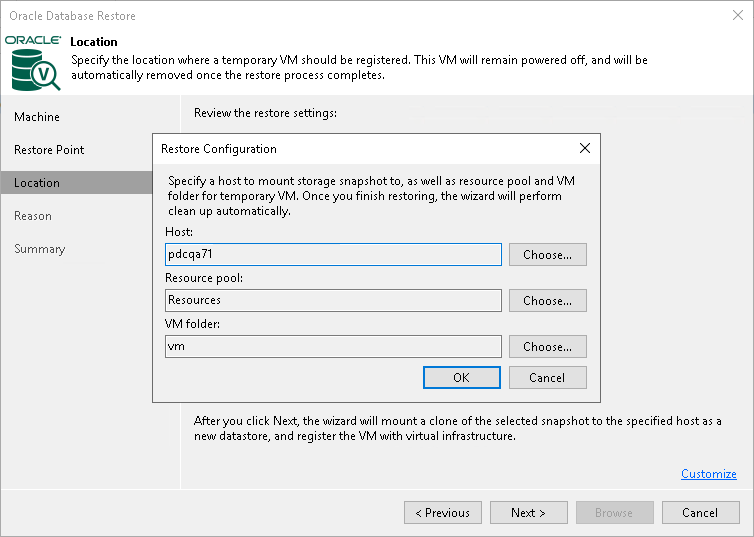 On the selected ESX(i) host, Veeam Backup & Replication will create a temporary VM and mount the disks of the virtualized Oracle server to this temporary VM. At the Location step of the wizard, click Customize. Next to the Host field, click Choose and select an ESX(i) host to which the snapshot clone/virtual copy must be mounted and on which the temporary VM must be created. Next to the Resource pool field, click Choose and select a resource pool to which you want to place the temporary VM. Next to the Folder field, click Choose and select a folder to which you want to place the temporary VM.